PARK CITY, Utah — There was a time not all that long ago when Hyundai’s product lineup, while generally good, was unremarkable and easily blended in with the wallpaper. To be sure, their design was on the weird side – case in point, the Santa Fe compact crossover utility vehicle that debuted in 2000 as a 2001 model. But over the years Hyundai has evolved nicely, with significant improvements in reliability, gas mileage, and its game-changing 10-year, 100,000-mile warranty. Things continued to improve, especially since 2011 with the introduction of the fluidic sculpture redesigns, and additional new product offerings. Since then, car shoppers have been rewarded with excellent Hyundai vehicles like the well sorted and competent compact Elantra sedan, quirky but fun new Veloster, best-selling Sonata, gas-sipping Ioniq hybrid, all-new and class-leading Kona sub-compact crossover and excellent Tucson compact crossover. But perhaps Hyundai is best known for its crown jewel, the Santa Fe, which has sold over 1.6 million units in the USA, with each generation better than its predecessor. Now for 2019, the fourth generation Santa Fe — which is basically is a replacement for the smaller outgoing Santa Fe Sport — has just been released and is on sale now at dealer showrooms. I recently spent a full day behind the wheel of the Santa Fe’s newest rendition at the media introduction in Park City, Utah, the ski-resort town, with driving elevations above 8,000 feet. While it’s a fact of automotive engineering that vehicles always get better over time, mostly in the form of incremental improvements, it’s easy to declare “incremental” wasn’t going to cut it for the new Santa Fe. Hyundai’s designers and engineers have nailed it, clearly breaking away from its mass-marketed competitors, rendering them almost obsolete. That’s a significant declaration, so let me explain. To be fair, Hyundai provided the top-trim level Ultimate model for testing and, as expected, it came well equipped with loads of standard equipment, features and advanced safety technology. Things like the panoramic sunroof, heated and cooled front and rear leather seats and heated steering wheel, the excellent 12-speaker Infinity Premium audio system with QuantumLogic Surround Sound & Clari-Fi music restoration technology, a dash-propped eight-inch display with navigation, plus a seven-inch virtual instrument cluster. 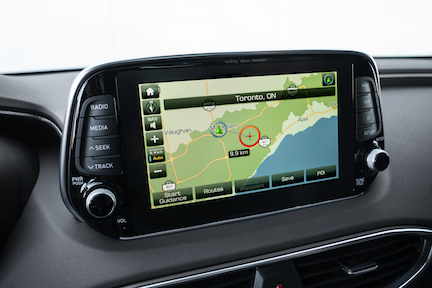 There are knobs on both sides of the larger display screen to control volume and audio tuning and a head-up display for vehicle speed and navigation info. One of the best features are the particularly comfortable seats with individual adjustments for the front and back of the seat bottom along with an extendable thigh cushion that rolls up rather than sliding fore and aft. Interior designers have added different foam densities, targeting spots to improve comfort and support. The attention to fit detail and quality, and the use of premium materials is evident. We were impressed with things like the fabric used for the ceiling headliner and door pillars, the sort you’d find on fine furniture. There are some hard plastics, but they have been nicely textured and matte finished, instead of shiny surfaces. Interior room is especially noticeable and appreciated. At 6-foot-6-inches I was able to adjust my seat comfortably, and a 6-foot plus passenger could still sit comfortably behind me, without their knees under their chin. The steering wheel tilts and telescopes, there are shade curtains on rear windows and, thanks to a design that lowers the vehicles beltline, outer visibility is excellent with size increased by more than 40 percent. From every viewing angle, the exterior has received an extensive makeover, not unlike the smaller Kona, and could easily pass for luxury crossovers like the Infiniti QX50 or Lexus NX. 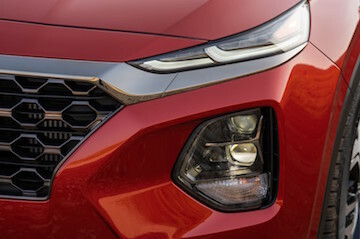 The new polygonal shaped satin-finished “cascading” grille gets a chainmail-like texture with Jeep Cherokee-like LED daytime running lights mounted above. Headlamps are actually down below adjacent to the grille. Both the front and rear are more upright in design and there are now 3D taillights that look great. The rear liftgate is dissected by satin finish between the taillamps, and can be operated with a swipe of the foot under the bumper. There’s a large single exhaust tip on the lower valance but we think a dual exhaust design would significantly add the to appearance. 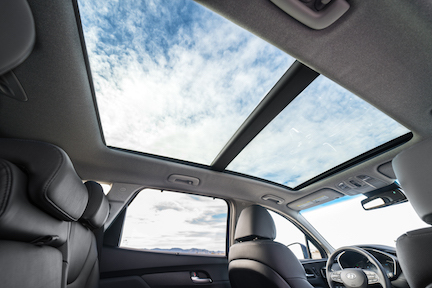 What we consider to be the most significant feature that not only sets the Santa Fe apart from its competitors, but also pushes it to the top of its class, is the addition of new standard SmartSense safety technologies. These include automated emergency braking with avoidance assist and pedestrian detection, lane-departure warning and lane-keeping assist, driver-attention warning, and automatic high beams. The lane keeping assist is unique in that it has four level settings to choose from. The top level automatically and actively keeps the vehicle centered in the lane; the one below automatically steers the vehicle back into your lane when you’re crossing the line; the third level just flashes a warning light; and the fourth level completely turns the system off. The system will hold the car centered in a curve, even on two lane roads. While you need to keep your hands even gently on the steering wheel, should you remove them, the vehicle will give both a visual and an audio warning to put your hands back on the wheel, or the system will disengage. Standard rear cross-traffic collision-avoidance assist uses the blind spot detection system’s radar sensors when backing up, and warns the driver if vehicles approach for the rear side. If it senses a pending collision, it will also automatically apply the brakes. Several automakers have developed systems that remember if you’ve opened the back door, and then reminds you to check the rear seat before exiting the vehicle, usually with a chime and message on the instrument panel. Hyundai takes it a step further by debuting a system that uses an ultrasonic sensor to helps detect movements from children or pets in the rear seat, after the driver leaves the vehicle and locks the doors. The vehicle will honk the horn and send an alert to the driver’s smartphone via Hyundai’s Bluelink connected car system. The system is designed to prevent children and pets from being forgotten in the car, but it also helps if children accidentally lock themselves in the vehicle. The horn will repeatedly honk until the vehicle is opened. This is tremendous technology that will certainly go a long way to help reduce the number of children and pets that die each year from heatstroke by being left in a boiling hot, overheated car interior. The new Santa Fe also introduces Hyundai’s first standard Safe Exit Assist system. Safe Exit Assist uses radar to detect cars approaching from the rear, and cautions passengers looking to exit the vehicle. If a passenger attempts to open the door when a car is approaching from behind, a visual and acoustic warning on the center cluster will alert the driver. 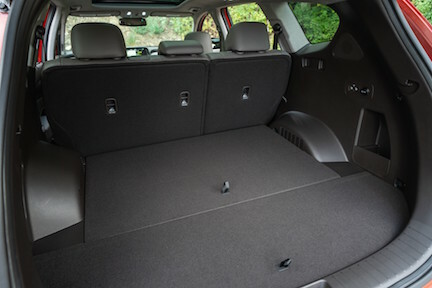 In addition, if the driver attempts to deactivate the Electronic Child Safety Lock feature, Safe Exit Assist will override the driver and ensure the rear doors remain locked until the approaching vehicle has passed. Once the road is clear, the driver can then deactivate the Electronic Child Safety Lock and successfully unlock the rear passenger doors. The Santa Fe is powered by either a turbocharged 2.0-liter four-cylinder 235-horsepower engine or a 2.4-liter with 185-horsepower. Hyundai dropped the previous model’s 3.3-liter V-6. An eight-speed automatic transmission replaces last year’s six-speed automatic. 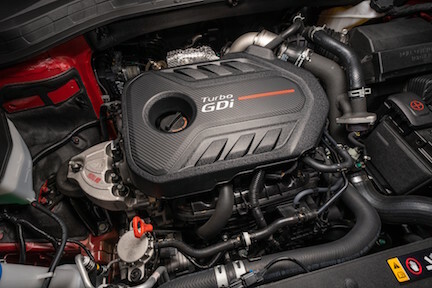 Our Ultimate trim level was powered by the 2.0-liter. There’s also a new HTRAC all-wheel drive system, available on all trim levels. The driver-selectable HTRAC Normal, Sport and Smart modes help provide confident control in all weather conditions. In addition to the extreme altitude driving route that most auto manufacturers would avoid, Hyundai wasn’t shy about including rough roads, rural gravel roads that were both rutted with washboards and muddy, water-filled potholes from the previous day’s heavy rains. Our test vehicle performed much better than expected at the high altitudes and never felt out of breath. At the end of our driving day, we finished with a steep 500-foot 35-degree or so hill climb over a deeply rutted, muddy and small boulder-strewn trail that demonstrated vehicle capabilites that most owners will most likely never attempt. The Santa Fe easily negotiated the climb, clawing its way to the top without drama. It is also equipped with hill descent control that keeps the vehicle at a steady speed on slippery declines, however, we didn’t get an opportunity to test it. While we didn’t get an opportunity to drive a model with the less powerful 2.4-liter engine, we were impressed with the performance of the 2.0-liter, but at times felt we were pushing its capabilities to its limit. Overall, the 2019 Hyundai Santa Fe is a sweetheart of a vehicle. From its attractive new styling, exclusive and class-leading safety features and technology, and bang-for-the-buck value, shoppers in this segment will be hard pressed to find a better choice, especially given its value pricing and class-best new-car warranty. Finally, while the new Santa Fe does not come with a three-row option, we expect we’ll see a new three-row Santa Fe XL in the very near future. Final Assembly Plant: Montgomery, Ala.